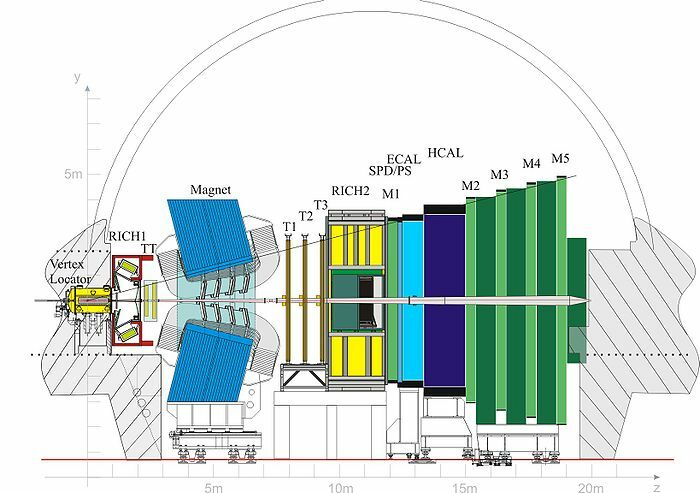 LHCb, one of the two "satellite" experiments at the Large Hadron Collider, is a detector focusing on the production of B hadrons in proton-proton collisions. It does so by looking at only one side of the collision point, which is showered by the majority of the debris produced when one very-high-momentum parton inside the proton coming from the other side hits a moderately or low-momentum parton in the other proton coming from the LHCb side of the collision region. A sketch of the LHCb layout is shown below. You might well ask, Why does a similar arrangement targets B production ? The answer is simply that B hadrons are copiously produced in those very asymmetric collisions; the added bonus is that they exit the collision point with high momentum -driven by that of the higher-momentum parton- and so they travel long distances before decaying: this makes their identification and study much easier. The lifetime of most B hadrons is only slightly higher than one picosecond or so (10 to the minus 12 seconds), so a B hadron moving slowly will decay where it is created or at an immeasurably close distance from there. But there comes the relativistic dilatation of times: if a particle moves with respect to us at a speed close to the speed of light, time for it will move slower than it does for us! So if the B hadron has, say, a momentum of 500 GeV, it will live a lifetime a hundred times as long as its 1.5 x 10^-12 seconds, as viewed from the laboratory frame; this will allow it to travel several centimeters away from the production point, making it very easy to reconstruct its characteristics. 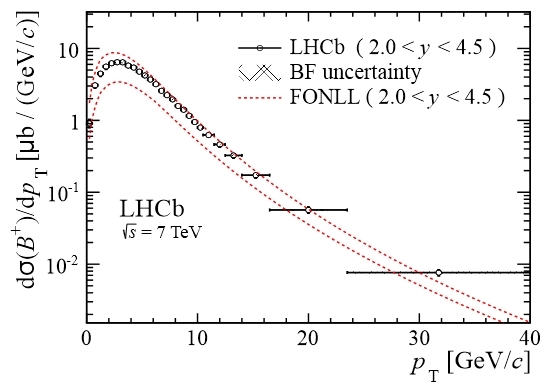 Now, LHCb produced a new paper in the arxiv today, which reports on an important measurement of the production rate of B mesons - particles composed of a b quark together with a lighter quark. The measurement is very important for particle physicists, because it allows us -er, them- to verify their understanding of low-energy quantum chromodynamics interactions that take place when the B meson is created. B meson candidates (B^+, B^0, and B_s mesons are separately studied: these are the combination of a anti-b quark with a up, a down, and a strange quark, respectively) are collected by relying in the identification of a J/ψ meson, which is a frequent and clean decay product of the B particles: the J/ψ decays to a pair of muons, which can be measured and identified very precisely thanks to their characteristic penetration power. Once a J/ψ is reconstructed, the combination with a positive kaon, or a neutral one, or a phi particle yield clean signals of the three B meson species. A fit of the mass spectrum of the candidates allows their count, and given the large statistics of the collected dataset, it is possible to study the production rate as a function of the kinematic characteristics of the B meson candidates: their momentum transverse to the beam direction, and their rapidity (a variable connected with their angle of production). Above is one of the figures from the LHCb paper. It shows that the physical quantity determining the production rate of these particles, the "cross section" (in this case the one measured for the B^+) is determined very precisely as a function of transverse momentum. A comparison with existing theoretical models allows to further our understanding of the mysterious production mechanisms of hadronic collisions.